This kind of Dragon boat race originates in China and is very popular in many Asian countries, also in Okinawa and Nagasaki, where it is know by various names, see above. It is used as a kind of divination for the harvest of this year. It also occurs at other times of the year, for example on May 5. In Nagasaki, it used to be part of the annual "harbor festival" in April, but now it is a separate event on the fourth sunday in June. Sometimes there is also a race on the first sunday of August. The Dragon Boat Festival is a lunar holiday. The official festival is also known as the Double Fifth Festival, because it occurs on the fifth day of the fifth moon of the lunar calendar, and Poet's Day, because it commemorates the failed rescue attempt in 295 B.C. of Qu Yuan. Qu was a Chinese poet, hero and Minister of State to the King of Chu. Qu warned the king against signing a fake treaty, and for his effort he was exiled. Dejected, Qu wandered the countryside and then drowned himself in the Milo River. The local fishermen raced out in their boats to save him, beating drums to scare off any fish that might eat his body and dropping rice into the water to nourish his spirit. 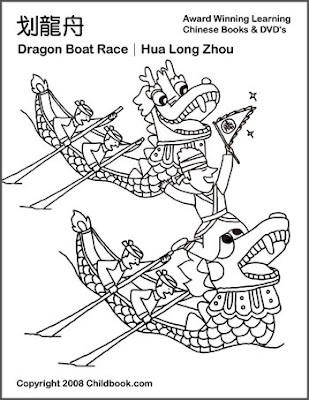 Today's Double Fifth Festivals include dragon boat races -- with beating drums and rowers tossing rice into the water. The dragon boat is a canoe with 10 rows of benches (for the 20 paddlers) and the heads and tails of "dragons" attached at the helm and stern (also where you'll find the drummer and steersperson). In a ceremony, a Taoist priest will "bring the dragon boats to life." The race is a sprint, lasting under 5 minutes. 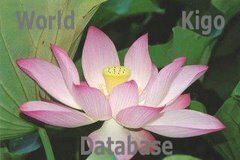 Since the sport of dragon boat racing offers great teamwork experience and interaction, and the festivals seek to promote multiculturalism, there are many crews (teams) from corporations. Besides getting them in shape, they get to sample the terrific traditional food of the dragon boat festival! A traditional dragon boat festival has kicked off in Japan's southernmost prefecture of Okinawa. The annual "Naha Hahrih" boat race was introduced from China some 600 years ago to pray for good fishing catches and safety at sea. About 100 rowing teams, some from local junior high schools, are taking part in the 3-day event, which started on Thursday at Naha Port. 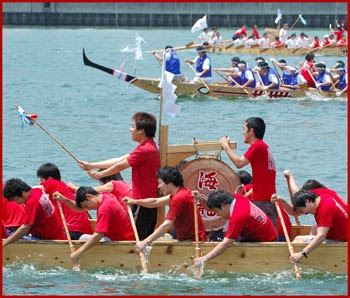 Each race involves 3 teams of 32 rowers each in "Haryu-sen" dragon-shaped boats. The teams pulled hard on the oars to a cadence set by a bell-ringer on each boat.